President Donald Trump met with pharmaceutical CEOs Tuesday in the White House. The president urged the drug makers to get prices down on life-saving drugs. “We have to get the prices way down,” Trump said. “You have to get your companies back here, we have to make products back” here, Trump said. 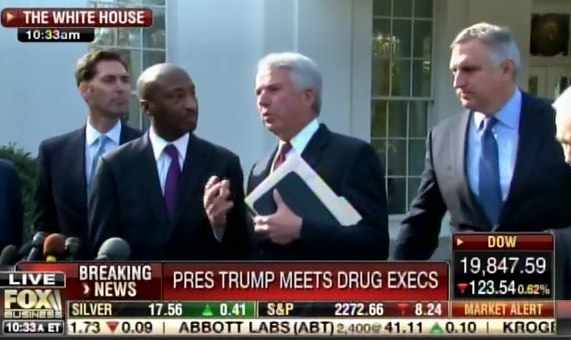 The CEOs of Merck, Amgen, Eli Lilly, Novartis and Johnson & Johnson, as well as the head of the trade group PhRMA participated in the discussions. After the meeting the CEOs praised President Trump on his plans.